The young student who set off a media firestorm at Bar Ilan University Sunday when she spit at MK Ahmed Tibi does not regret doing so, the student, A told Arutz Sheva in an interview Monday. “I spit at Tibi once, but he spits at us every day, 365 days a year.” she said, and spitting back at him was simply serving up justice. 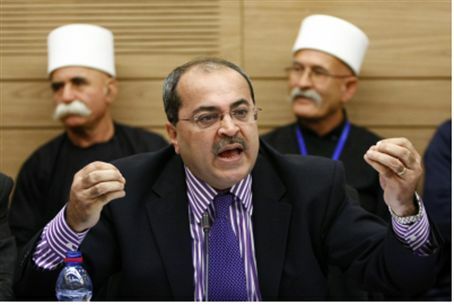 The incident occurred during an election debate event which pitted Tibi against MK Aryeh Eldad. The two engaged in a sharp debate, with each throwing insults and accusations against each other. The “home crowd” of students, many of them supporters of Eldad, made their feelings clear to Tibi, and as the Arab MK left the auditorium, A spit at him. A said that she had no regrets doing so – and no illusion as to what Tibi was doing at a university where he knew he would be almost universally despised. “He came just to start provocations and incidents,” A said. While she admittedly did create an incident when she spit at him, she said she felt she had no choice. “I spit at Tibi because he supports murdering Jews,” she said. “He said during the debate that he did not recognize the concept of 'Land of Israel,' and he called Meir Kahane a 'terrorist.' Tibi hurt my feelings, and the feelings of all others in the room,” A added. Although she spit in his direction, A said that Tibi was unharmed, and untouched, in the incident. “He didn't even pay attention to my spitting at him, as he was wrapped up in trying to milk the event for everything he could to look good to his voters.” Her action was noticed by members of the media, who reported on it, thus eliciting dozens of negative reactions and sharp criticisms from across the political spectrum. “It was really nothing, and unfortunately he is making a much bigger deal of it than it really is, in order to enhance himself,” A said. Police said Monday night that they were opening a criminal investigation into the incident. A will be investigated for insulting a public official and possibly incitement, police said.